Health food nuts, please stop reading right here. Do not go any further as you are sure to be offended. After working long hours and weekends, Nate and I were sick of take-out and sandwiches. So, we decided to drown our woes in whisky. 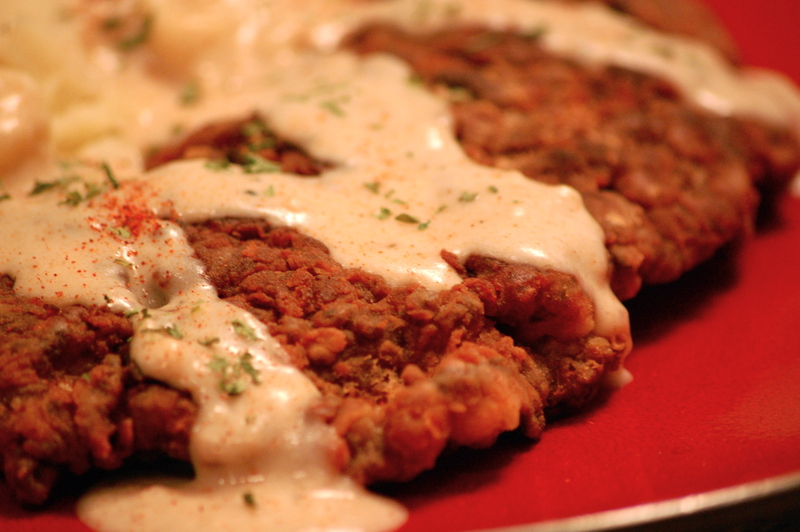 Oh wait, I meant to say Chicken Fried Steak. We really don’t have any whisky at all. We very rarely have CFS because it’s not heart-healthy and it’s not easy to make. However, when you need comfort food, this is where you should turn. My friend Lisa once went on a 12-state quest for the perfect chicken strip and even carried her own jar of honey in the back seat of her car. This was so her research would be accurate and have only one variable – the Chicken Strip. For the past few years, my husband Nate has been on a quest to create the perfect CFS recipe. He has done a lot of research in our home kitchen and he has enjoyed every single bite. I would say he’s hit pay-dirt with this recipe, but there are a lot of details in it. This is not a short-cut recipe. In fact, Nate uses sirloin steaks, which he cuts in half and tenderizes by hand. 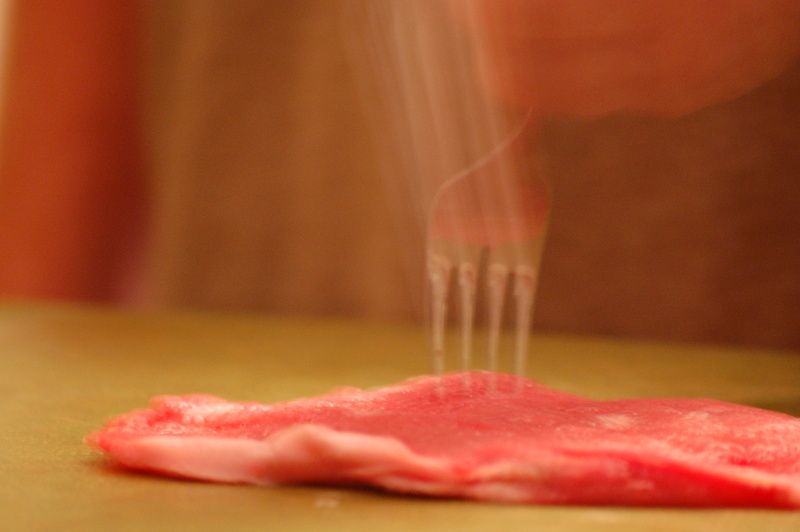 He uses a fork to tenderize the steak first – a technique that Alton Brown used on his Food Network show, Good Eats. He then tenderizes the steak with a Coke bottle the way his Grandma Bertha did when he was growing up. This time we didn’t have a Coke bottle, so we used a beer bottle and I’m pretty sure that Grandma Bertha would not have approved of that. This double method makes them fork-tender every time. One of our pet-peeves when reading recipe reviews is this: “I didn’t have smoked gouda, so I used Velveeta cheese instead. I give it one star. “ That being said, Nate believes that it’s very important to follow the recipe exactly; however, there is a teaspoon of MSG in this recipe. We don’t cook with it very often, so we don’t worry about it much. Please leave it out if you like, but the flavor will suffer some. Use 2 pounds of sirloin steak, trimmed of all visible fat and pounded to a 3/8 ‘s inch thickness. Use a fork to pierce the meat repeatedly until your arm feels like it’s going to fall off or the meat is looking a little worse for wear. Choose your favorite beverage that comes in a glass bottle – we won’t judge you if it’s a beer – use the open end to tenderize the meat until it feels like it may fall apart. Dip the seasoned steaks into the flour and then the egg wash and then back into the flour. Transfer each to a baking sheet covered in wax paper and let rest for ten minutes. The resting period is crucial because it helps the crust adhere to the meat. Bring ½ inch of Canola oil up to a medium high heat. Cook each steak individually for five minutes, flip and then cook an additional three minutes. Temperatures vary on different stoves, so you may have to adjust the heat or cooking time – just look for a golden brown crust. Serve with mashed potatoes and sawmill gravy. Try adding a few turnips to your mashed potatoes for a little more flavor. After eating, walk 12 miles on the treadmill and repent. No whisky OR Coke, no wonder I didn’t get invited…. but, just, yum.